This was Roland's last analogue drum machine and both sound-wise and circuitry-wise it is very similar to the Roland TR-606. You get 6 analogue sounds - kick, snare, open hat, closed hat, cymbal and clap, with accent controls, a balance (EQ / tone) knob, and trigger out. You also get four banks of 8 patterns and classic Roland LCD grid programming thats very similar to the TR707. 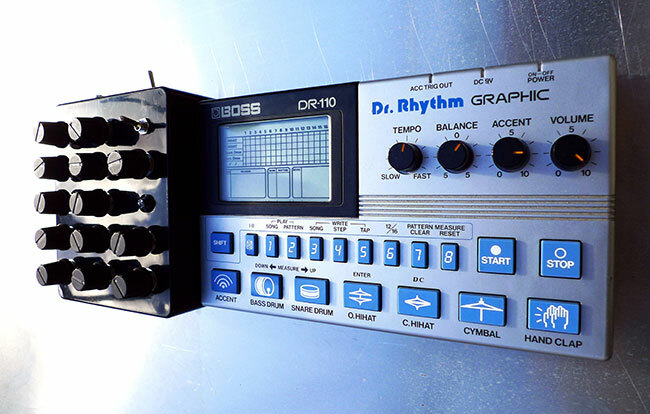 So why, we hear you ask, would anyone spend over £300 on a TR606 when a Boss DR-110 can be picked up for around £60? The only answer we can come up with is the the sight of the words 'Roland' and 'Analogue' in the same sentence causes temporary insanity in some people which makes them part with vast amounts of cash for what is essentially a massively overpriced and over hyped piece of junk. The controls for the Hats and Cymbal do tend to interact with each other a little because of some doubling up of the circuitry for the sounds but that just tends to lead to some more bizarre top end sounds. 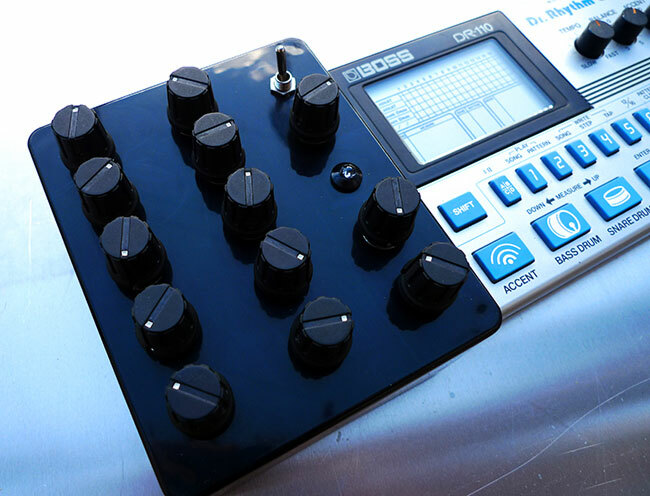 As with all drum machines based on these same basic circuits, the pitch and decay knobs for the bass drum also interact with each other somewhat, with the decay amount changing with the pitch and longer decays being available around the middle settings of the pitch knob. At extreme decay settings the bass drum produces a continual low frequency tone. The only major disadvantage the DR110 has compared to the TR606 is that the 606 has DIN sync and the standard DR110 has no way of syncing it to other kit. Even if you do discover where to inject DIN sync into the circuit you then find that for some reason the DR110 runs on 12ppqn where as standard DIN sync runs at 24ppqn. We solved this simply by installing a DIN sync interface round the back of the mod box with a divide down circuit to stop the DR110 running at double speed. There's even a bright blue LED to show when the DIN sync is active. Take a listen to the demo mp3's to hear what this machine sounds like now. the first demo is a modded DR110 synced to a x0xb0x. There's no mixing other than the output of the DR110 plugged into the 'mix in' of the x0xb0x.. It was recorded live in one take. The other three demos are a modded DR110 on its own. 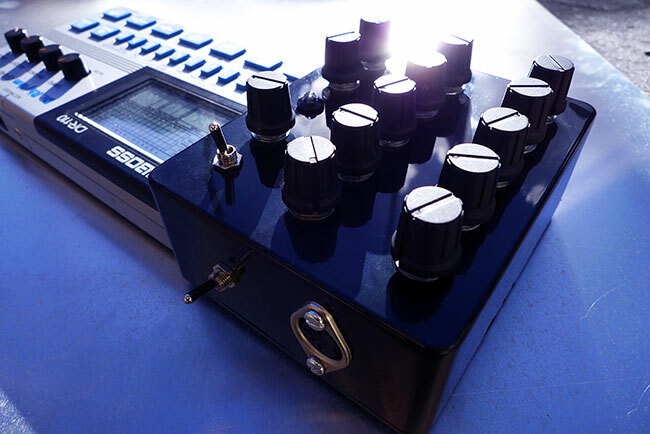 WARNING: THESE DEMOS FEATURE KICK DRUM SUB-BASS! This was a very tight squeeze but we've finally found an effective way of installing an internal DIN-sync interface into an otherwise unmodded DR110. 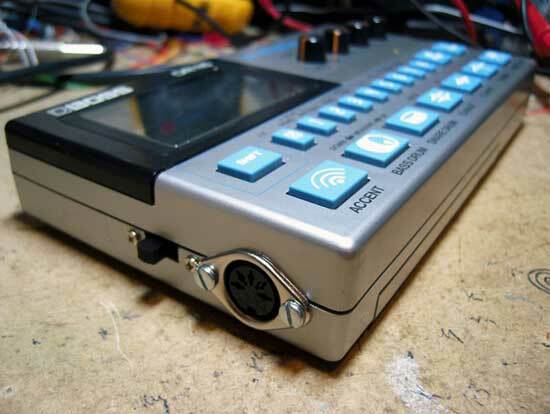 The interface accepts a standard Roland 24ppqn DIN-sync signal and converts it to the 12ppqn clock required by the DR110. It also solves the run/stop issue found on most DR110 sync interfaces, where the DR110 doesn't reset itself to the start of the bar when you press stop on the master clock device. The DR110 wasn't designed with DIN-sync in mind so the stop, reset, and play functions don't operate in a standard way. Without fixing this it means that when you stop, and then press play again on the master clock, the DR110 just starts from where it stopped playing regardless of whether the master clock is playing from the start of the bar or not. You can get around this by pressing stop on the master clock, then pressing stop on the DR110 to reset it, then you have to press play on the DR110 to arm the sync again before pressing play on the master clock. As you can imagine, its not the ideal way of working, so we hacked some logic onto the DIN sync run pin so now when you press stop on the master, the DR110 stops, automatically resets itself and re-arms the play to wait for another start signal. The sliding switch on the side selects between internal and external sync. Unlike a couple of other DR110 sync mods we've seen, you can switch between the sync modes at any time without stopping playback or restarting the machine.